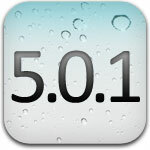 Apple has released the first update of the original iOs 5 i,e iOS 5.0.1 to the public for iPhone 4, iPhone 3GS, iPad 1, iPad 2, iPod Touch 3G and iPod Touch 4G. This update fixes many bugs including battery drain issue, iPad smart cover security issue and inclusion of multi touch gestures to the iPad 1. Please note that if you device relies on jailbreak, then you should wait until there is jailbreak for iOS 5.0.1. 0 Respones to "Download iOS 5.0.1 For iPhone, iPad, iPod touch"